This long-lasting water-resistant sun cream blocks both UVA and UVB rays. The smooth cream comes in the natural beige shade with a matte finish that can be used as a long-wearing color correcting foundation primer. Corrects Skintone and minor imperfections. It comes in a pale golden tube with a shiny metallic orange cap. The packaging is very convenient and the nozzle dispenses just the right amount of cream everytime you use it. It's travel-friendly. The cap closes tightly on the tube without having to worry about any spillage in your bag. Aesthetically also, it looks quite appealing. The texture of this sunscreen feels like a mixture of liquid foundation and a cream. The consistency is neither too runny nor too thick. It does get absorbed quickly, it gives a matte finish and because I tried it on my dry skin, it felt a little patchy but after few minutes that feeling narrowed down. And, when I tried it on my hand (which is not as dry as my face), it blended in beautifully without applying much effort. Also, it's lightweight, non-greasy and doesn't leave a white cast. The formula of this sunscreen is best suited for people with oily skin. A very good sunscreen for hot summer days. The only thing about this cream that doesn't work for me is its natural beige tint. It is a cool pinkish sort of milky white beige colour that doesn't suit my complexion. The tint just makes my face appear unnaturally whiter. Maybe, it'll suit someone with a pale complexion with a very strong cool undertone. The only way I make this work for me is that I use very little quantity of this cream and blend it all over. That way, it doesn't look crazy white on my Indian medium to fair skin tone. 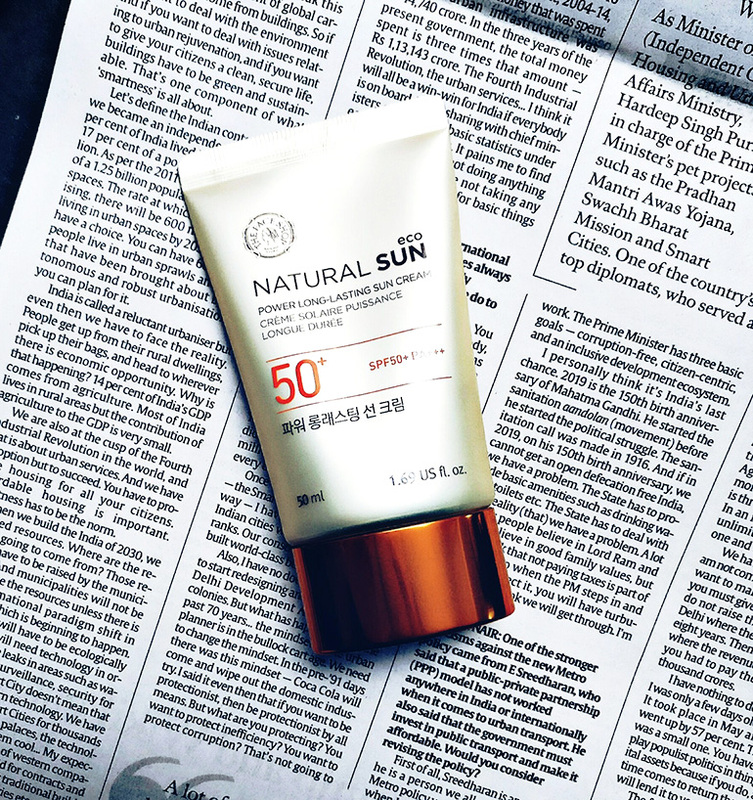 It delivers pretty strong protection from the sun with an SPF of 50+ and Pa+++ which lasts for hours. Thus, giving adequate protection from both UVB and UVA radiation. 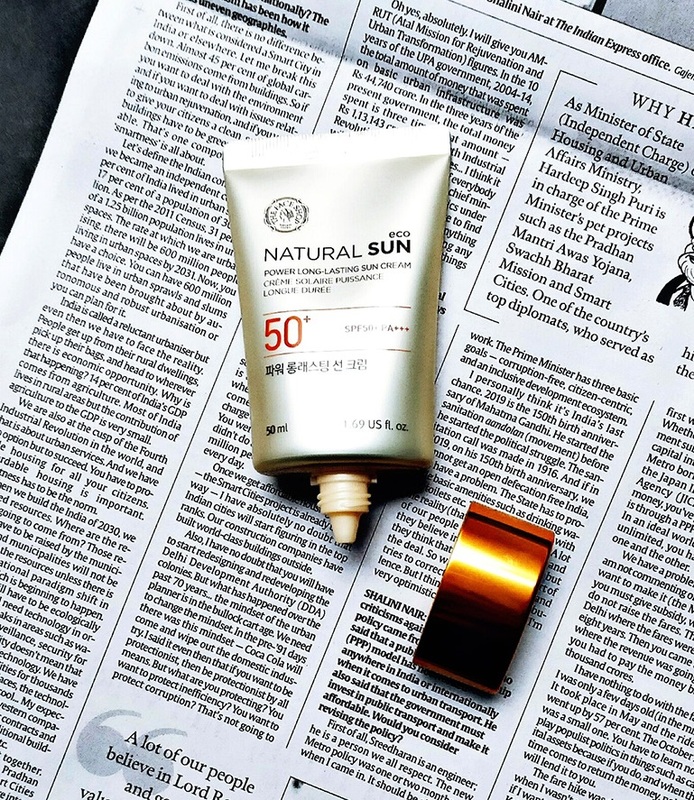 Also, it contains sunflower sprout extracts that help in combating acne and providing anti-aging benefits by making your skin less sensitive to the sun. I have never been a fan of tinted sunscreens. I feel you need to apply more amount of sunscreen to protect yourself. And if its tinted, we can use only small quantity. So it defeats the entire purpose of a sunscreen. Thanks for sharing this. I will skip it..